The How It Should Have Ended team is back in action, this time taking on the top grossing movie of 2016, Rogue One: A Star Wars Story. In their signature humorous fashion, they give several suggestions of how the movie could have ended, starting with the first scene in the movie, where Lyra Erso, instead of making empty threats, shoots first then threatens later. We see Jyn mirror that later, the big "Jedi reveal moment" that many fans thought they were going to get with Chirrut Îmwe. But the big "How it Should Have Ended" is a feeling, not a single specific moment: they wanted a happy ending! Indeed, they show how every character could have hypothetically survived (though that does hinge on Chirrut being a Jedi, which he's not), ending in their daring escape - and a hilarious Firefly reference that should make Alan Tudyk fans laugh and cry in equal measure. 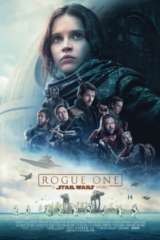 Check out the video above, and catch Rogue One while it's still in theaters - or again when it comes home at the end of March on Digital HD and early April on Blu-ray and DVD. Rogue One: A Star Wars Story is in theaters now. Directed by Gareth Edwards, it's the first of the new standalone features from Lucasfilm and Disney, which take place outside the core "Skywalker Saga" of films noted by an Episode number. Rogue One tells the story of the small band of rebels that were tasked with stealing the plans to the first Death Star. The story spins directly off the opening crawl from the original Star Wars: Episode IV - A New Hope. In that crawl, it read: "Rebel spaceships, striking from a hidden base, have won their first victory against the evil Galactic Empire. During the battle, Rebel spies managed to steal secret plans to the Empire’s ultimate weapon, the DEATH STAR, an armored space station with enough power to destroy an entire planet." Star Wars Rebels Season 3 Dead Pool: Who Will Die by Season's End?